He wants to play kind of geo-economical politics mixing with Hindu nationalism. His target is to restore India’s ‘ancient glory’ to play cilvilizational role on the basis of domestic strength. From being a tea-seller at Gujarat’s railway stations to becoming India’s fifteenth prime minister, Narendra Modi is assuredly a real-life Slumdog Millionaire. His charisma, vision and passion for Hindu culture, exceptional oratorical skills and unbelievable self-confidence have made him one of the most watched leaders in the world. Modi has two main foreign policy goals – to consolidate India’s status as regional hegemony in South Asia and to attract the foreign direct investments (FDI) critical for India’s growth. Modi also launched the campaign ‘Make in India’ to attract businesses from around the world to invest and manufacture in India. During the general election campaign Modi called out China’s potential aggression along the border with India and making ‘illegal immigration’ from Bangladesh an election issue specially during the later part of his campaign in eastern states like Assam and West Bengal. He also asserted that Hindus outside the country would be able to seek asylum in India should they require it. After getting a landslide victory in the election Modi invited all leaders from the South Asian Association for Regional Cooperation (SAARC) to his swearing-in ceremony and held bilateral talks with each of them on his first day in office. The most significant initiative made by the Narendra Modi government is the focus on neighboring countries and major Asian powers coupled with emphasizing on the two decades old ‘Look East Policy’. Asia being the major focus area of his foreign policy, Modi and his foreign minister chose several Asian countries for their initial bilateral visits. Time and again Modi emphasized his belief on 21st century being the Asian century and also asked whether it would be the Indian Century. China, Japan and India being the first, second and third largest Asian economy respectively are among the most likely candidate to lead the strategically important Asia in the later part of this century. But China’s increasingly assertive postures in the region in recent years have raised concerns in the respective quarters. It seems Modi’s foreign policy is focused on improving bilateral relations to higher levels with strategically located Asian countries like Japan, Vietnam, and Australia without forging any formal security alliance in the Indo-Pacific region to avoid direct confrontation with China. India, due to its good relation with both Russia and United States, is often considered to be the swing state in the race for strategic dominance in Asia between the democratic alliance of Japan and US and China-Russia club on the other hand. In June, Modi made his first foreign visit to neighboring Bhutan and in August he went to Nepal. He was the first Indian Prime Minister to visit the Hindu kingdom of Nepal in 17 years, where he offered a $1 billion line of credit for infrastructure development and energy projects. India knows it must assume the status of a regional power before it can court global rank. On the 18th SAARC summit in Kathmandu, Indian prime minister has revealed his strategy something like: to ignore Pakistan to the hilt, to deepen India’s ties with the rest of SAARC countries, and to counter China’s influence in SAARC. Modi also often says for greater regional integration at all levels of socio-economic development of South Asian region. India has a debilitating relationship with its closest neighbor Pakistan. Modi has taken a tough stand, cancelling foreign secretary-level talks due to the Pakistan High Commissioner’s meeting with Kashmiri separatists at a time when ceasefire violations by Pakistan are also on the rise. After a brief flicker of optimism, their bilateral relations have soured once again. Now they’ve settled into a pattern of acrimonious accusations and cross-border exchanges of fire over Kashmir, the disputed Himalayan state that’s sparked four of the six conflicts the two nations have fought. The rising tensions have raised fears that the withdrawal of U.S.-led international combat forces from Afghanistan would create space for India and Pakistan to wage a proxy war there. The diplomatic fallout has had lethal consequences. Within the past few months, border security forces have engaged in heavy shelling across the border, killing dozens of civilians and security personnel, shattering a ceasefire that has held for the better part of a decade. The previous year, when Nawaz Sharif was contesting his own elections, he made bettering relations with India – “normalization” as both Pakistan and India call it – a campaign promise. Many thought that with two governments both interested in normalization, both having secured solid majorities in their respective election victories and facing little domestic political opposition, it is finally time for the nuclear-armed rivals to move forward. With Bagladesh, India is signaling a softer line from Prime Minister Narendra Modi than when his party, the BJP, was in opposition. He has taken a move toward settling the long-simmering border dispute with Bangladesh. This deal would end decades of uncertainty nearly 50,000 people living in about 160 enclaves on the “wrong” side of their homeland’s border. This is also a geo-economical strategy of Modi. Acoording to him, the deal could help curb ‘illegal immigration’ from Bangladesh. Now Modi often Modi reiterates that India would do everything for the growth, peace and prosperity of Bangladesh. He pointed out the potential of enhanced people-to-people contact including through tourism between the two friendly neighbours. He stressed on the opportunities that existed for trade and commerce through sea and river routes. He also suggested that the Indian business communities should explore the possibilities of greater investment in Bangladesh. Modi said, the past, the present and the future of India and Bangladesh were interlinked. Anyway, in just Six months in office, Narendra Modi has made official visits to Bhutan, Nepal and Japan followed by the United States, Myanmar, Australia, and Fiji. While Modi’s Japan visit is being spoken of in terms of the investments Japan has promised as well as some important strategic agreements Modi and Abe signed, with an eye on China, other aspects of Modi’s foreign policy were also revealed. Chinese President Xi Jinping flew to Modi’s hometown of Ahmedabad in Gujarat on the occasion of Modi’s 64th birthday on September 17. Modi and Xi tried to downplay the border incidents. 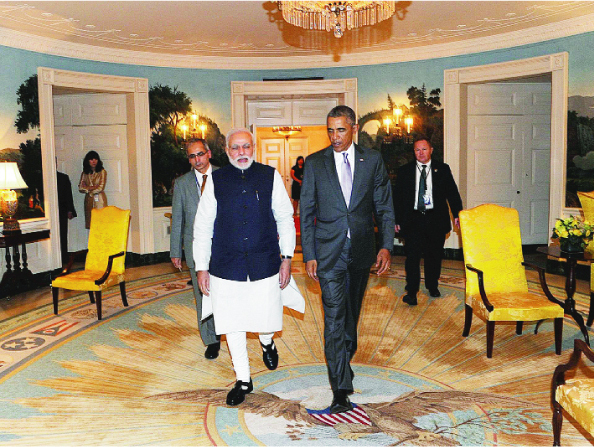 For Modi, the visit was a chance to attract Chinese investment into Indian infrastructure and manufacturing projects. For China, it was an opportunity to pry India away from the overtures of Japan and the United States. Xi offered to invest $20 billion in Indian infrastructure and manufacturing sectors – a dramatic rise compared to the $400 million it has invested throughout the past decade. China will also build high-speed rail links and construct two industrial parks in India. In a speech at the end of his visit, Xi contended that “only when the China-India relationship develops, will a real ‘Asian Century’ emerge.” But question is that how Modi would react to incursions by China, since India has close economic relations with its neighbour and, in spite of some roadblocks, these ties have seen significant improvement. After all, it can be said that foreign policy under Narendra Modi-led is seen greater emphasis on commercial diplomacy. It has a greater attention to long-term policy planning with a view to formulating grand strategy in shaping India’s national security and formulating doctrines. However, Modi’s priority is the economic development at home. That will require regional stability if it is to succeed and could force Modi to tone down his confrontationist approach and reach out to India’s neighbors. Modi will have to ensure peaceful external conditions in India’s immediate neighborhood. He is aware that an unsettled neighborhood with various failed and failing states puts considerable strain on the economy.